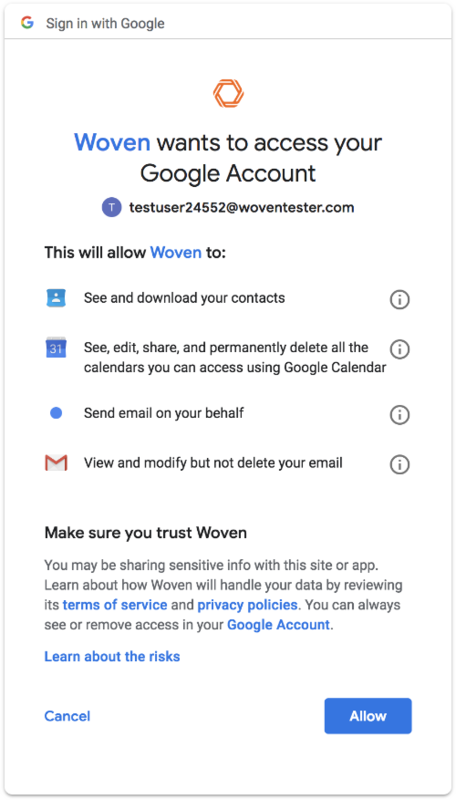 How does Woven use Google permissions? See and download your contacts: We use your contacts to allow you auto-complete email message recipients and event participants within Woven. Because an email message recipient or an event participant is always represented by a name and an email address, names and email addresses are the only things we retain from your contacts. We do not, for example, use any phone numbers or addresses (However, being able to quickly access a participants phone number and/or address is a feature request that has come up before). See, edit, share, and permanently delete all the calendars you can access using Google Calendar: Woven is a calendar-centric application and we constantly add new calendaring functionality. We ask for wide permissions here to better manage your calendars and events within Woven. However, note that, even though this permission does allow deletion of calendars, we do not offer such functionality within Woven and have no plans to offer it in the future either. Unfortunately, Google does not provide a permission bundle that would allow us to see, edit and share your calendars but not delete them so we ask for the permission to delete as well, even though we do not use the delete functionality. Send email on your behalf: This permission is solely used to allow you send new email messages from Woven, for example to start a scheduling conversation; or, to reply to existing email messages already associated to one or more of your meetings. We sometimes pre-populate the text to send but we never automatically send anything. For every message we send using this permission, you always have to click on an action button in our user interface. View and modify but not delete your email: Woven bridges the gap between your email and calendar by (a) allowing you to view emails associated with a meeting; and, (b) automatically detecting new scheduling-related emails. These two features utilize the “view” permission to achieve their functionality. The view permission is also how Woven Assistant determines you asked for its help. The “modify” permission is used to label the detected scheduling emails inside Gmail so that you know Woven recognized them. We also have an upcoming functionality where you can ask us to auto-archive all scheduling-related email conversations to declutter your Gmail inbox. We do not use the “modify” permission for any other purpose. Remember that you can always revoke these permissions from Woven by visiting https://myaccount.google.com/permissions in a browser, expanding the name “Woven” and clicking on “Remove Access” button.